"Youghiogheny" redirects here. For the commuter rail service, see PATrain. Map of the Monongahela River basin, with the Youghiogheny River highlighted. The Youghiogheny rises in northern West Virginia, in Preston County southeast of the town of Aurora and near Backbone Mountain. The headwaters are approximately 10 miles (16 km) north of the headwaters of the North Branch of the Potomac River and pass through Silver Lake before flowing north-northeast into Garrett County, Maryland, then flowing north past Oakland and roughly parallel to the West Virginia border, separated by approximately 3 miles (5 km). The river enters southwestern Pennsylvania on the border between Fayette and Somerset counties. It flows northwest through a gap in Chestnut Ridge and then past Connellsville. It joins the Monongahela River from the southeast at McKeesport, southeast of Pittsburgh. Upstream from Confluence, Pennsylvania, approximately 6 miles (9.7 km) north of Pennsylvania border, the river is impounded by the 184-foot-high (56 m) Youghiogheny Dam to form the Youghiogheny River Lake, a reservoir that stretches upstream into northern Maryland. The dam was completed in 1944 primarily for flood control. 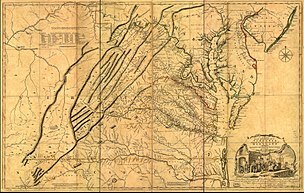 In the colonial era and in the early United States, the valley of the river provided an important route of access through the mountains for settlers and military forces from Virginia to western Pennsylvania and the Ohio Country. In 1754, as a militia officer of the British Colony of Virginia, George Washington followed the river in an attempt to find a water route to Fort Duquesne, then held by the French. The pioneer town of Somerfield, Pennsylvania, was inundated by the building of the Youghiogheny Dam. Perryopolis in northern Fayette County, Pennsylvania, is the site of the George Washington Grist Mill. The Youghiogheny River Trail follows the river in southwestern Pennsylvania southeast of Connellsville. Coal mining became an important industry along the lower Youghiogheny River during the 19th century. At the time the name was often spelled Yohoghany (or variants thereof), and during the 1860s and 1870s that spelling was used as the name of a post office near what is now Shaner in Westmoreland County. Fallingwater, designed by Frank Lloyd Wright, is located in the river valley southeast of Connellsville. Lower Yough, which runs through Ohiopyle State Park from Ohiopyle to Bruner Run ( Class III) This section is the busiest whitewater trip east of the Mississippi River, being completed by over 250,000 people each year. Further downstream, near Connellsville, the river is much slower, without whitewater rapids, and is able to be piloted by personal tubes, kayaks or canoes. Although the Youghiogheny is generally considered to be safe for whitewater recreation, there have been 19 deaths on the Lower Yough. At least five, and possibly as many as 14, of the fatalities have occurred at a rapid within the Lower Yough known as Dimple Rock. Dimple refers to both the Class III rapid by that name, as well as an undercut rock in the middle of the rapid by that name. Some of the deaths were attributed to preexisting health conditions, with 9 of the 14 being caused by the rock itself. The Youghiogheny is also known for fishing, having brown and rainbow trout, as well as smallmouth above the power plant discharge. Part of the Great Allegheny Passage, a multi-use trail along the former Western Maryland Railway right-of-way, extends from Pittsburgh to Confluence. From Confluence, it connects to Washington, D.C. The Great Crossings is the place on the river where George Washington and General Braddock forded the river in revolutionary times. The Youghiogheny River was likely the inspiration for the fictional Yuggogheny River, whose valley was used by Michael Chabon for the setting of his short story "In the Black Mill" from the 2000 collection Werewolves in their Youth. His 2001 story "The God Of Dark Laughter" is also set in Yuggogheny County. In Chabon's 2000 Pulitzer Prize-winning novel The Amazing Adventures of Kavalier & Clay, an expert or experts on Yuggogheny cannibal cults are present at the party where Joe Kavalier saves Salvador Dalí from drowning. The Youghiogheny River is mentioned (malapropped as "Young-iogheny") in an episode of the Rocky and Bullwinkle cartoon show. The river is also referred to (as Yochio Geni) in Thomas Pynchon's novel Mason & Dixon. ^ a b c Based on information from United States Geological Survey (USGS); USGS 03083500 Youghiogheny River at Sutersville, PA retrieved March 17, 2007. Sutersville is several miles upriver from McKeesport and thus the real figure is higher. ^ a b USGS, Table of average annual daily discharges for Youghiogheny River at Sutersville, PA, retrieved March 17, 2007. Figure cited is for 2005, most recent year for which figures are available. ^ a b USGS, Table of average annual daily discharge for Youghiogheny River at Oakland, PA, retrieved March 17, 2007. FFigure cited is for 2005, most recent year for which figures are available. ^ "Youghiogheny". Merriam-Webster Online Dictionary. Retrieved December 23, 2008. ^ Donnalley, Thomas K. (1908). Handbook of Tribal Names of Pennsylvania. Histree. p. 61. ^ Zimmer, True Stories from Pioneer Valley, 14-17. ^ Pennsylvania Department of Conservation and Natural Resources Newsletter retrieved September 5, 2010. Palmer, Tim (1984). Youghiogheny: Appalachian River. University of Pittsburgh Press. ISBN 0-8229-5361-7. Wikimedia Commons has media related to Youghiogheny River.